One would wonder how these large ballparks or stadiums have such a perfect stripes effect on their grass. They are made through commercial lawnmowers that are very expensive. In addition, they are handled by professionals, who have been paid to make those stripes effect. However, one can create a striping effect through a normal mower by following some simple things. Although a normal lawnmower does not have the ability to create a good stripes effect, one can make a small and ordinary effect through the normal lawnmower if used with proper technique. Start mowing your lawn from the end, and try to move the mower in a straight line. One can make stripes effect in width or length of the lawn, or one can even make the stripes effect at a diagonal length. Once you have mowed in a straight line until the end of your yard, turn around off the yard to prevent the grass from being mowed. Now mow back in the opposite direction, meaning that you will return to that end from where you started mowing your lawn. Always position the mower just inside of the previous line to make sure that none of the grass is left to cut. Always keep your head up to see whether you are maintaining a straight line or not. Continue mowing in the same manner until you have finished mowing your whole lawn. Once you have finished mowing your lawn, detach the cutting blades and attach the light weight roller to your lawnmower. Now depending upon your own liking, start making stripes effect. 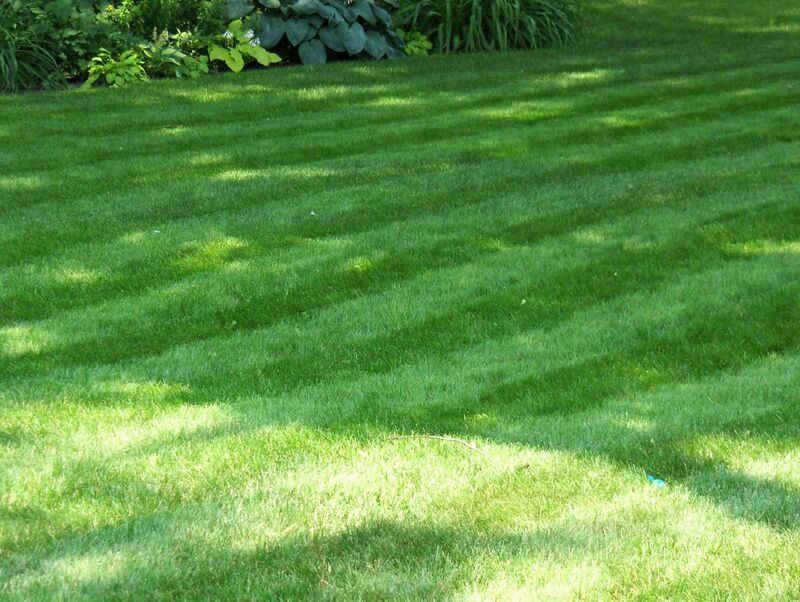 If you want to have length stripes, move your lawnmower back and forth in a straight line from one end of your lawn. Once you have bent all the grass blades of that line, switch to other line. Make sure that you start rolling the other line after leaving the same amount of space in between your other rolled line. Repeat the process throughout your lawn until you have achieved a perfectly balanced length stripes in your whole lawn.